Configure the Session Replication in Tomcat. In first setup, we configure the Load Balancer using Apache httpd web server. Its open source and widely used. Second setup is session replication in Tomcat through modify/add <cluster> tag in server.xml file. These tomcat instance may run on single machine or different machine. these setups are take more time and very difficult to debug. Is there is any alternative to load balancer? Yes, Nginx its emerging web server. this post we are going to discuss how to setup nginx as a load balancer in our tomcat cluster. Nginx is open source and alternative to Apache httpd web server. Its provide more performance and little memory foot print. we can install nginx through either repository (apt-get,yum) or from source. here i m build nginx from source from here. then extract the compressed file. --with-http_ssl_module here i specified install SSL module (https), its not necessary. If we want secure webpage then this module is needed. now open browser and go to http://localhost to get nginx default page. Nginx configurations are stored in nginx.con file in conf/ folder. 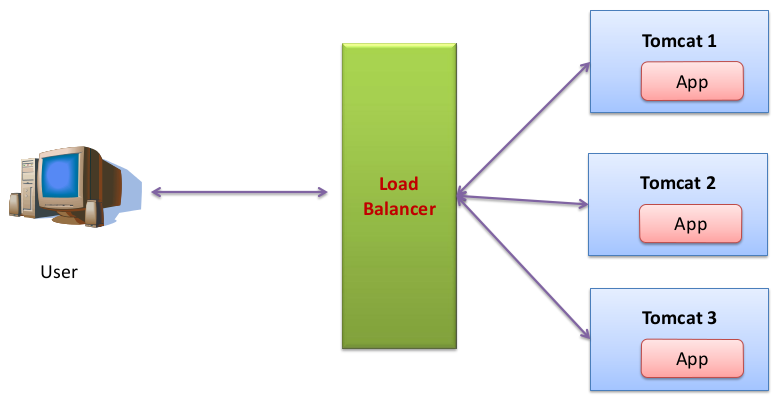 We need to perform 2 steps to make nginx as load balancer. Upstream block provides simple load-balancing across upstream (backend) servers. In upstream block have unique name (here tomcatcluster), later we need to point out from other block. here we define the back-end servers (Tomcat instances) via server directive. In each server directive we mention IP address of server and HTTP port number(Not AJP port number). This step is forward the request to upstream blocks, where we define the back end servers. here if location / is already present, then remove and add this new one. here proxy_pass directive, proxifier(forward) the requests to upstream servers. here tomcatcluster is name of the upstream block and we used http protocol to forward the request. that's it. Load balancer is ready. now start the tomcat instances based on my previous post (session replication). then start nginx. This is same as non-sticky session method we used in my previous posts. If we want sticky session, then nginx directly not provide, but some 3rd party patches are available. but nginx provide ip_hash directive. Its forward all request from single IP to same tomcat like sticky session. But sticky session works based on cookie (session). but ip_hash is based on IP address of client. just restart the server, u feel like sticky session concept. when we compare the Nginx to Apache httpd web server, nginx is provide simple configuration, and can handle huge amount of traffic, consume little memory foot print and its take little CPU load. search Nginx vs Apache we get some amazing benchmark results.